(MCB) offers overload and short circuit protection. The E 2000 line provides two levels of interruption capacities, 6 kAIC and 10 kAIC, at 480 Y/277. These circuit breakers are small, modular and flexible. The E 2000 are DIN rail mounted in 1-4 pole construction. These single-pole breakers are suitable for protection of mains and semiconductors (converters/rectifiers) in a variety of railway and industrial applications. The feeder and rectifier breakers come with operating currents up to 8,000ADC and operating voltages up to 3,600VDC. All comply with IEC 947-2 and ANSI C37.14. EntelliGuard G is GE’s newest line of low voltage circuit breakers. This line of circuit breakers are available to OEMs in 3-and 4-pole designs from 400A(IEC) with fault interruption ratings up to 150kA. Circuit breakers protect local, and remote monitoring, relaying and communications. EntelliGuard Trip Units are designed to supply communications for Modbus or Profibus protocols. The breaker-trip provides circuit protection without arc flash protection. 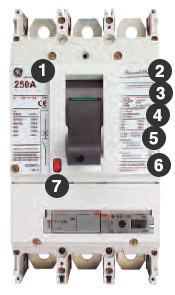 EntelliGuard G 3-pole breakers are the standard in GE AKD-20 Low Voltage Switchgear. EntelliGuard G devices are available in standard, 100% rated, ANSI, UL and IEC ratings. Components come in 4 different 4 pole designs and can be operated electrically or manually. Molded Case Circuit Breakers are used to provide reliable circuit protection within switchboards, motor control centers and lighting applications. For protection during a short circuit or overload Molded Case Circuit Breakers will shut down to avoid breaker trips, opening the circuit and protecting the conductors. When normal conditions are acting properly in the system, the breaker can be closed and switched on again. Power/Vac switch gear is designed meet ANSI,IEEE and NEMA standards. Power/Vac is assembled to meet a variety of protection and switching applications. Power/Vac serves many functional units such as, incoming line, radial feeders, feeder bypass, bus-tie, bus-entrance and auxiliary units. Power/Vac is low on maintenance, non-polluting, environmentally friendly and slow load currents after loss of vacuum. The Power/Vac is a reliable interrupter, hi-technology devices that provides a 3 or 5 cycle power switching and long service life.